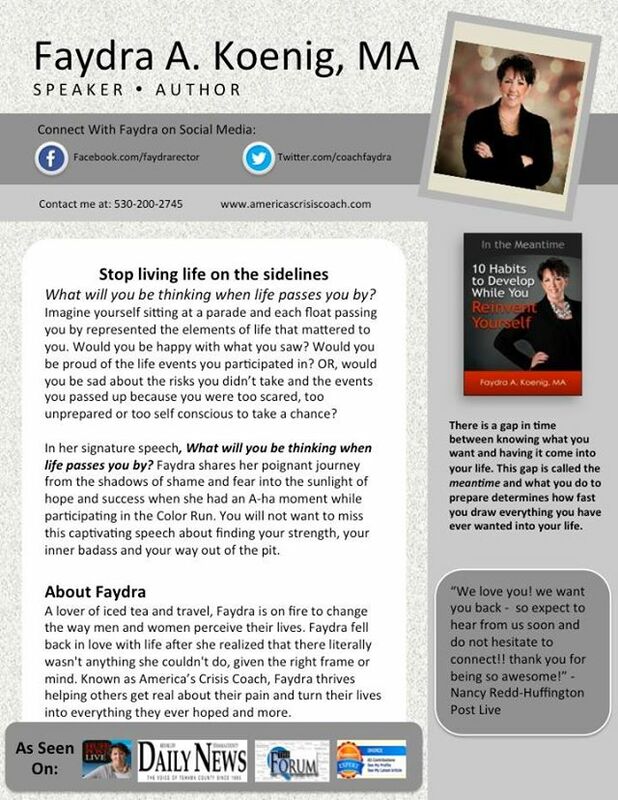 Simple, Quick, and Easy To Customize Speaker One-Sheet Templates So You Can Market Your Speaking Business Like a Pro!" Especially If You Know Nothing About Graphic Design! As you're building your speaking business you know you need certain marketing tools in place. 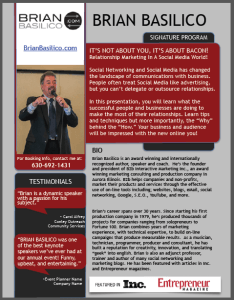 Things like videos, testimonials, photos of you speaking, a website, and a speaker one-sheet. Or maybe you call it a speaker sheet. Or a one-pager. Whatever you call it, you know having an attractively-designed document that lays out your program and your personal info is a must to help you look like a pro. Designers you've found either cost too much or create designs that look they were made in a toddler's paint program. You don't have a clue about how to take the great ideas in your head and have them transformed into something you can use. You're so busy running your business that your one-sheet keeps getting pushed to the bottom of your to-do list. You have no idea what to include in your one-sheet. How Do I Know You Need This? My name is Felicia Slattery and that's me on stage speaking. 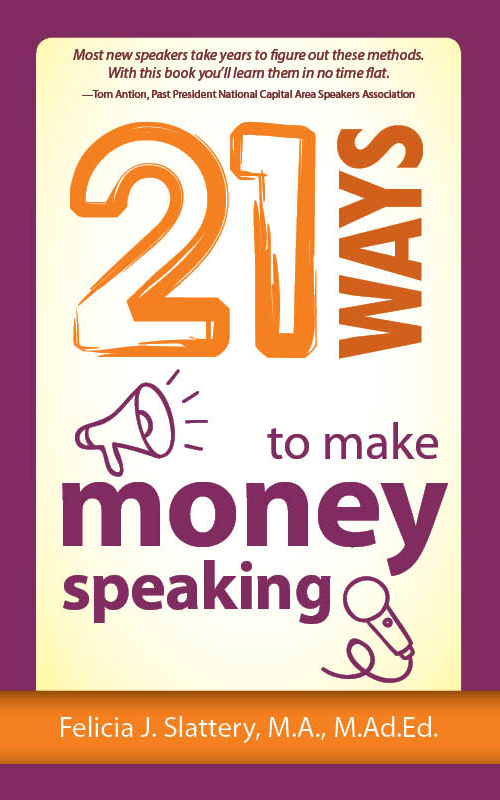 I also wrote a little book called "21 Ways to Make Money Speaking," which hit #1 on Amazon in five categories before Noon on launch day. I've been speaking and teaching people how to make money speaking for years. I know this stuff because I'm still in the trenches of professional speaking myself. Right now. Every. Single. Day. Meeting planners ask for certain things over and over again. Your one-sheet is at the top of that list. And you better have one ready to send when they ask. If you don't, they'll be moving on to the next speaker on their list who has one. Even though my clients and readers know they need a speaker one-sheet, they have long-struggled with some of the problems listed above. It pains me to see my clients feeling stuck. And the more I hang around with speakers, especially those who say they want to start doing more speaking, and start getting paid well for it, the more they tell me they need something like this. You're not hired by one person with one phone call, like you might be with coaching or consulting. The way the meeting planning business works is the meeting planner spends a lot of time going through speaker materials. Then they get on the phone with a few speakers to see whose personality they like and feel like they click with. After that, they take your materials to a meeting with a committee or another decision-maker, who you almost NEVER have access to. That means your marketing materials HAVE to tell your story. Speak volumes and make you look like a pro. Watch this short video to see what you're getting and how easy they are to customize. You get 5 actually it's 7 totally different one-sheet template designs to choose the right look and feel you want to communicate. PLUS, you'll find anywhere from 8-10 color palettes to choose from within each design template. And if the pre-designed colors don't work, or you've got specific logo colors associated with your brand, no worries: your templates are 100% customizable. That's a Total of 51 Different Variations! Top Tab - in 10 Different Colors! Bold & Powerful - in 9 Different Colors! Diamonds & Dots - in 9 Different Colors! Faces of You - in 9 Different Colors! Unique Angle - in 8 Different Colors! Double-Sided Designs INCLUDED - in 4 Different Colors! In this specially prepared, 5-page guide, you'll discover the basics of good design, so when you begin to customize and have fun playing with your new Speaker One Sheet Templates, you won't get carried away and the finished product will present your most professional image possible. EVERYTHING YOU NEED TO SUCCEED WITH A SPEAKER ONE SHEET! Real Results From Happy One-Sheet Clients! 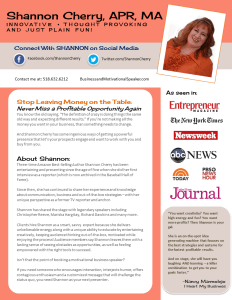 "These one sheet templates came at the right time for me! Before, I've spent hours before working with a graphic designer to create one sheets. These templates were a huge time saver! I love how simple, easy to read and attractive they are. The templates have everything you need to establish credibility yet to keep it simple. Felicia even created easy to follow step-by-step videos. This is a big plus! I love the flexibility of the templates, how you can change colors and take out sections you don't want. 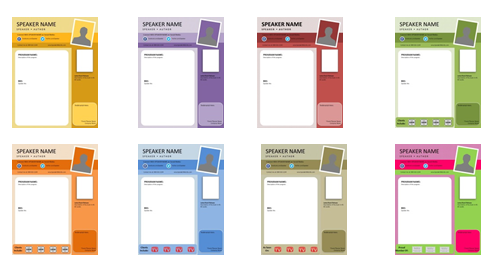 You can also customize the templates for each speech or audience. I'm so proud to be able to hand this to someone. Thanks so much!!" "We love these templates so much, we invited Felicia Slattery to do a presentation on one-sheets to our elite membership group. So easy to use. Perfect for any speaker!" "I've Already Booked a Keynote!" "I've already booked a keynote with my self-designed one-sheet. As someone with more than a few presentations under her belt, I already knew the importance of speaker one-sheets. The problem was I like to customize them for each event planner, so I can show I can create the perfect speech for their audience. Even with a designer on call, that can become costly. So I decided to try Felicia's templates. Within 15 minutes, I had created a personalized one-sheet. And within minutes of sharing it with the event planner I was hired to keynote at a 500+ room event. What an ROI!" "It Took Me Less Than 20 Minutes to Create This!" "These templates are absolutely amazing. I love the way that even within each option there are a variety of options to choose from. After I gathered all of my information, it took me less than 20 minutes to create this one sheet and most of that time was spent with me trying to decide which design to use. It was very easy to edit the content areas, change the size of the font, and even add new images. I am in no way technologically savvy, but using this template made me feel like a pro. Thanks Felicia!!" "I Didn't Need Any Special Technical Skills!" "I'm one of those speakers and coaches who actually gets technology because I spent a lot of my corporate career in IT. But my business is busy and I don't always have time to do everything I need to do. I was pleasantly surprised at how I didn't need any special technical skills to get my one-sheet done. Finally! Another thing crossed off my to-do list to help me get more speaking gigs. The hardest part about completing this template was remembering where I had stored the picture of my book cover! It was *that* easy." How long has creating your one-sheet flyer been on your mind and your to-do list? How much time and money have you wasted trying to find a designer? Or playing around with design software you don't know how to use? How long have you been trying to design your own one-sheet? Or going to a cut-rate site and being terribly disappointed at what you got? You could easily spend hundreds of dollars and countless hours on a 100% custom design. These Speaker One-Sheet Templates Save You Time and Money. How Much is Your Time Worth? 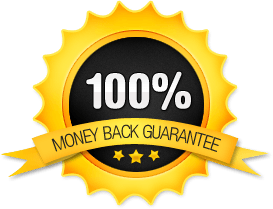 When you get paid to speak, you can easily be generating thousands of dollars per speaking engagement. If you're just starting out, you should know that $2,500 is at the lower end of many meeting planners' budgets. But what if you've never been paid to speak and suddenly someone wanted to pay you $1,000 to show up and speak for an hour on the topic you're passionate about? How cool would that be??!! This is a tiny investment in a professional marketing tool you can use again and again. Month after month. For years to come. If I charged you $100 per template (like other people do) that would be a really good deal. But I want to make this totally fair and completely accessible to you. That's why for a very limited time, I'm offering these templates - the complete Speaker One-Sheet Master Package at just $97. Who tells you what they can't guarantee? I do. Because I'm not full of fluff and malarkey. Before we continue, if you ask for a refund 5 minutes after you purchase, the answer is no. I can't guarantee this is going to work on your system, but if you have PowerPoint 2010 or higher it should. If it doesn't I'll refund your money. I can't guarantee how long or how little time adjusting these templates will take you, but I can guarantee I'll show you via video how to make all the changes with very little effort and virtually no frustration. If you really don't get it and can't make them work, I'll refund your money. I can't guarantee these will be the snazziest, prettiest, most awesome designs ever. That would be impossible because it's subjective. (I love them and am proud of them!) But I can guarantee the files are clean, crisp, and have been designed by a professional designer. If they look fuzzy, distorted, or pixilated to you, send me screenshots, if we can't fix it, I'll refund your money. I'm NOT going to refund your money if you buy only to look and then change your mind. You can see the basic designs and colors in the thumbnail galleries above, as well as in the video which shows two color selections of all five of the templates, and even a finished sample in the testimonials. Finally you get to see one of the templates up close and personal in the demo video above. Not to mention you can customize just about everything to match your branding, image, logo, colors, etc. If you're a tire kicker, move along. By making your purchase, you are indicating that YOU DO HAVE ACCESS to POWERPOINT 2010 or newer (or will shortly after purchase have access). YES! I Need These Speaker One-Sheet Templates Now! I understand I will receive Instant Access to all 45 One-Sheet Templates, the exclusive One Sheet Template Changes Checklist, PLUS Quick Reference Design Guide for the low price of $97. Single Use License Only. Click Here to Purchase a Multi-Use Developer License. I'm excited to see your custom design and hear about your results getting hired as a speaker when you start using your new speaker one-sheet! P.S. These Speaker One-Sheet Templates are JUST what you've been waiting for. P.P.S. Before your head hits the pillow tonight, using only PowerPoint and with zero design skill, you can have your new, personalized Speaker One-Sheet working for you on your website and ready to print for any meeting planner who's interested in YOU! "So Many Opportunities, I Can Hardly Keep Up With Them All!" 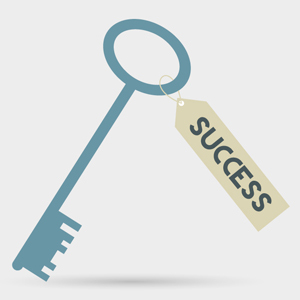 "Felicia has helped me completely transform my business and my future. 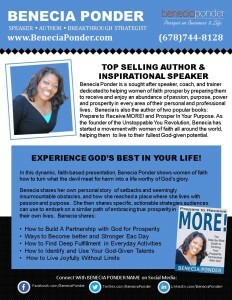 I hired her to coach me with building my speaking career and to create an online information products business. She has knowledge and experience that teaches you how to maximize your business in a minimal amount of time. If you are not motivated and excited by her energy and enthusiasm, you need to see your doctor. She is a connector, teacher, motivator and just a fabulous resource that delivers over and above customer service! I can't recommend Felicia highly enough - only 4 months later I have two new online products and so many opportunities, I can hardly keep up with them all." Use the PDF version on your website so meeting planners can easily see more about you, print it from their end, and share it with their bosses, event committees, etc. Get high-quality copies made at your local print shop and use them in a direct mail campaign to reach out to meeting planners along with a copy of your book, pages of testimonials, sales letter, branded object(s), and more. Use the JPEG version as part of the header on your Facebook profile. Use the JPEG version as the header on your Twitter account. 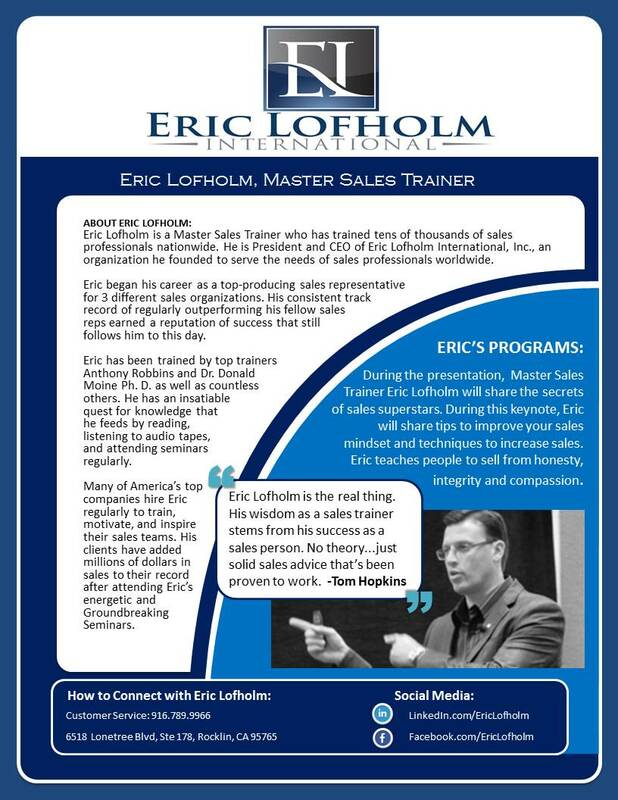 Link to the PDF version on your website from your LinkedIn profile. 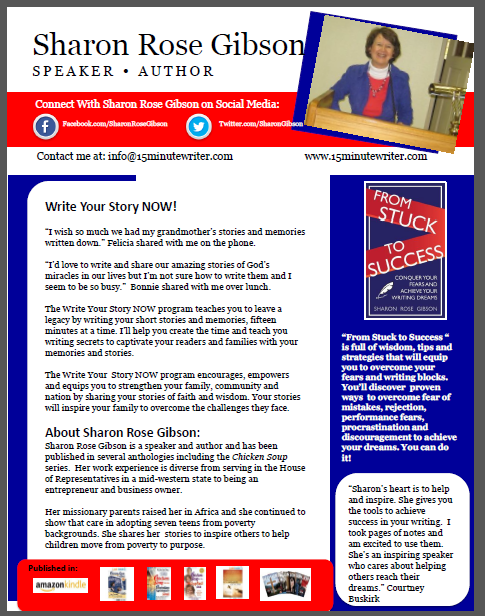 Send it as an attachment via email to anyone who inquires about your speaking. Email all your personal and professional contacts with a copy or linking to your website telling them how excited you are to have your own professionally-designed speaker one-sheet and ask for contacts of meeting planners. Write a blog post about your speech topic and feature your one-sheet as the featured image. Announce on Facebook, Twitter, LinkedIn that you now have a one-sheet and created a speech around your topic of expertise. 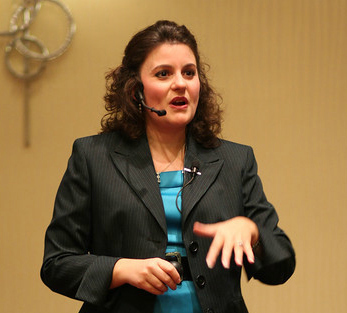 Give your talk a compelling title and share some info about it. Work with a coach (like yours truly!) to help you build an entire speaking marketing plan that incorporates the use of your one-sheet as one of the printed materials. Really? All I need is PowerPoint to use these templates? YES! PowerPoint is all you need. These were designed on PowerPoint 2010, so you will need access to that version or newer to make these templates work for you. If you don't have PowerPoint 2010 on your system yet, you can get a free 30-day trial version from Microsoft. So get the free trial. Open up your template. Make your changes and you're good to go. I have a Mac and use Keynote Software. Will these templates work for me? YES! The Keynote software on Mac is PowerPoint compatible. How do I choose which template to use? Refer to the chart to determine which elements suit your speaking business best. Choose which options and elements are important to you to decide on your completed design. All of the templates can be easily customized to remove or add any elements. Can I really just type in my name, my program details, and add a few photos? Is that ALL there is to it? YES! The hard work is DONE FOR YOU! All you have to do is plug-and-play. With the design and elements already in place, you can quickly and easily add your information and images. Or take a few more minutes to play with your template and customize it even further by changing the colors, background look, fonts, and more - with a couple clicks of your mouse! Boom. Done and done. How long will it take me to customize my final design? Easily less than an hour. If you know which photo image you want to use (your headshot or speaking in-action image), have your short bio written, and have a description of your talk already done, you can finish in 15-30 minutes. If you have to write your bio and program description first, it'll take a little longer. Caution: you might be tempted to play with all the fun features and ways to make changes. If you're in a hurry, just follow the provided checklist and you'll be good to go, fast. Will my new template match my logo/website/branding colors? YES! 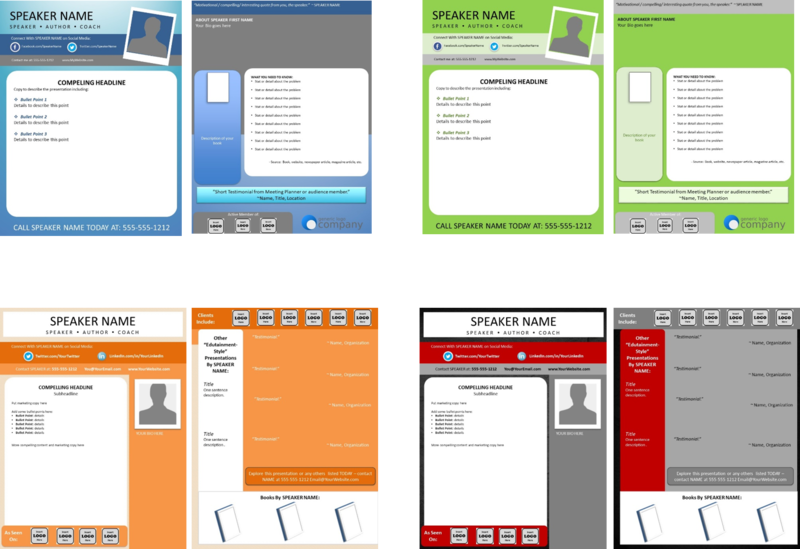 You'll find a color palette for all businesses and speech themes in each template option. Whether you're uber-masculine or girly-girl, button down corporate or green and granola-y, or anything in between, you'll find anywhere from 8-10 color palettes to choose from within each design template. You get ALL of the 8-10 color options when you choose your template. How much of the templates can be customized? Every single element. Every color. Every font. Every background. Every image. Every line. Every text box. Every EVERYthing! Do I have to be a techie to make these things work? Not at all! Even if you are the biggest technophobe around, if you know how to use Microsoft Word and make basic changes to PowerPoint, like typing text, adding photos, and hitting "Enter," you can use these. What If I don't need one of the elements in my favorite template? Delete it! Simple as that. Depending on the template and the element, you can replace it with something else, or leave it completely off without altering the look of the template. You'll see there are a few changes already made in each design so you can get a sense of what your final design will look like based on the elements you want to add to customize your template. 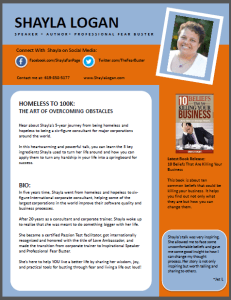 I'm a Virtual Assistant and ALL my clients will want me to do one-sheets for them. Can I serve my clients without having them each get their own templates? YES! There is a developer's license available in the check-out area so your clients don't have to know your little secret. With the developer's license, you get ALL 5 designs and ALL the color combos from each design with the licensed approval to use these as much as you like, for as many clients as you like.